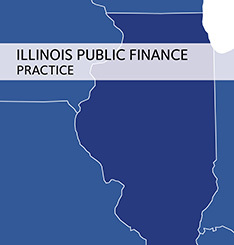 For a short overview of Chapman's Illinois Public Finance Department, please download our practice group's brochure. Since its founding, Chapman and Cutler LLP has been one of the country's preeminent law firms in state and municipal finance. Dozens of lawyers comprise the firm's Public Finance Group, primarily serving as bond counsel or underwriter's counsel on public finance transactions throughout the United States. Attorneys in the Group work as a team with colleagues in the firm's banking, tax, securities and bankruptcy and workout areas. Firm attorneys from other disciplines join the team whenever a significant public finance transaction warrants their involvement. The firm's public finance clients include state governments, state agencies and authorities, counties, cities, villages, towns, school districts and other special purpose districts and municipal non-profit corporations and authorities located across the country. In addition, attorneys in the Public Finance Group frequently serve as counsel to the leading national and regional investment banking firms in the underwriting or remarketing of state and local government obligations. The experience and ability of the firm's attorneys who devote their practice to municipal finance is widely recognized. Attorneys in the Public Finance Group frequently draft, review and lobby for new legislation that enhances the debt-issuing capabilities of the firm's clients. The Group's broad national presence and experience enable it to deal easily with complex transactions and to develop innovative financing structures. Toi Hutchinson, Chapman's Director of Community Relations and Social Responsibility, spoke at the 2019 Chicago Women in Public Finance Conference. Chapman attorneys Sarah Breitmeyer and Brent Feller spoke at the National Association of Bond Lawyers's The Institute. The SEC Rule 15c2-12 amendments will be effective on and after February 27, 2019 with the effect described in the Release. In addition, the Release describes the SEC’s position on certain material financial obligations that may have an impact on primary offerings in addition to disclosures of reportable events made in the future under Rule 15c2-12. Chapman attorneys Kyle Harding and Anjali Vij spoke at the 2019 Illinois Association of Park Districts / Illinois Park and Recreation Association Soaring to New Heights Conference. A recent court decision has provided guidance regarding the meaning of “governmental unit” under the U.S. Bankruptcy Code.This determination is important because if it is a “governmental unit,” an entity would only be eligible to file a bankruptcy petition if it is a “municipality” under the Bankruptcy Code and meets the other eligibility requirements for filing a municipal bankruptcy petition. In October, the U.S. District Court for the Southern District of New York entered a final judgment against Christopher St. Lawrence, the former Supervisor of the Town of Ramapo, New York and Director of Finance and President of the Ramapo Local Development Corporation. A decision by the Court overseeing Puerto Rico’s bankruptcy-like Title III proceeding has reiterated what every secured creditor understands — perfection matters. The Court found that bondholders holding $2.9 billion in debt issued by the Employees Retirement System of the Government of the Commonwealth of Puerto Rico were rendered unsecured due to inadequate financing statements. Chapman attorneys Juliet Huang and Nate Odem spoke at The Bond Buyer's California Public Finance Conference. Chapman attorney Joe Saverino spoke at the Illinois Association of School Administrators 2018 Annual Conference. Chapman attorneys Sarah Breitmeyer, Ryan Bowen, Nancy Burke, David Cholst, and Juliet Huang spoke at the National Association of Bond Lawyers 43rd Annual Bond Attorneys' Workshop. Chapman attorney Dan Bacastow spoke at the National Association of Health and Educational Facilities Finance Authorities Fall 2018 Conference. On August 20, the SEC issued Release No. 34-83885 adopting amendments to Rule 15c2-12 under the Securities Exchange Act of 1934, as amended. The amendments add two new events to the list of reportable events for which an issuer or obligated person must provide notice to the MSRB's Electronic Municipal Market Access website. Chapman attorneys Rick Cosgrove and Juliet Huang spoke at The Bond Buyer's Midwest Municipal Market Conference. Chapman attorney Rick Cosgrove spoke at the 2018 US P3 Infrastructure Forum. Chapman attorneys Dan Bacastow and Nancy Burke spoke at the 2018 NAHEFFA Quad State Plus Conference. Chapman attorney Rick Cosgrove spoke at the National Federation of Municipal Analysts 35th Annual Conference. Chapman's Juliet Huang and Toi Hutchinson spoke at the 2018 Association for Governmental Leasing and Finance Annual Conference. Chapman attorneys Erin Bartholomy, Kent Floros, Kyle Harding, and Anjali Vij spoke at the 2018 Illinois Association of School Business Officials Annual Conference. Chapman attorneys Erin Bartholomy and Sharone Levy spoke at the Illinois Community College Chief Financial Officers (ICCCFO) Spring Conference. Chapman attorney Dan Bacastow spoke at the Rooftops Conference Chicago. Chapman attorney Juliet Huang spoke at the National Association of Bond Lawyers' Tax and Securities Law Institute. Legislation recently passed by the Illinois House could impact every taxing district in the State if it ultimately becomes law. Senate Bill 851, which amends the Property Tax Extension Limitation Law, implements a tax freeze for certain taxing districts, and authorizes the implementation of a tax freeze for other taxing districts pursuant to referendum. Following a recent decision by the Court overseeing the Commonwealth of Puerto Rico’s bankruptcy-like Title III proceeding, bondholders should continue to pay close attention to the pledge securing their bonds to determine how those bonds would be treated in a bankruptcy proceeding. Chapman Partner David Cholst chaired and Partner Sarah Breitmeyer served on a National Association of Bond Lawyers task force that produced proposals to improve US infrastructure through tax reform. On August 23, the Securities and Exchange Commission announced settlements in enforcement actions against the Beaumont Financing Authority; Alan Kapanicas, the former executive director of BFA; O’Connor & Company Securities Inc., the underwriter of the BFA obligations; and Anthony Wetherbee, the co-founder and former primary investment banker of O’Connor Securities. The former Director of Finance for Ramapo, New York, was found guilty by a federal jury of 20 counts of conspiracy, securities fraud and wire fraud in connection with municipal bonds issued by the Town and by the Ramapo Local Development Corporation, a local not-for-profit corporation to further economic development in the Town. On June 12, the Department of Treasury issued the first report in a series regarding regulation of the financial system. The report recommends that high-grade municipal bonds be categorized as Level 2B liquid assets instead of generally being excluded as HQLA currently. Chapman attorney David Cholst served as drafting counsel on a comment letter submitted to the Internal Revenue Service by the American Bar Association's Section of Taxation. This white paper addresses pay for success legislation that has been adopted at the state level, pointing out the various functions of the pay for success financing structure and how individual states have treated these components within their legislation. On March 1, the Securities and Exchange Commission issued a release seeking comments on proposed amendments to Rule 15c2-12 under the Securities Exchange Act of 1934, as amended. The municipal industry has seen a significant change in recent years with the increased activity of the SEC Enforcement Division and, in particular, its Public Finance Abuse Unit. This is an updated version of an article Chapman attorney Kelly Kost authored for the October 2016 issue of the Illinois GFOA Newsletter. On January 10, 2017, the Securities and Exchange Commission (SEC) issued a cease-and-desist order (Order) to the Port Authority of New York and New Jersey (Port Authority) under which the Port Authority acknowledged that it acted negligently in failing to disclose certain risks in official statements for over $2.3 billion of bonds issued between January 2012 and June 2014. In a December 13 interview, the chief of Securities and Exchange Commission’s public finance abuse unit stated that the SEC does not expect to recommend any further settlements under its Municipalities Continuing Disclosure Cooperation initiative. Instead, the public finance abuse unit will focus on those issuers and underwriters that did not self-report disclosure violations under the initiative. Chapman served as Special Counsel to the underwriters of the San Diego Unified School District bond financing that was named The Bond Buyer's 2016 Deal of the Year. Chapman is representing a consortium of social service agencies in the State of Illinois' first pay for success initiative, which seeks to improve the lives of youth who are dually-involved in both the child welfare and juvenile justice systems. The Municipal Continuing Disclosure Cooperation initiative, as named by the Securities and Exchange Commission in March, 2014, has attracted much attention in the municipal industry and with good reason. On August 24, 2016, the Securities and Exchange Commission issued cease-and-desist orders to 71 municipal issuers and obligated persons in response to voluntary self-reporting of potential misrepresentations in municipal bond offering documents regarding compliance with prior disclosure obligations under the SEC’s Municipalities Continuing Disclosure Cooperation initiative. The Illinois Association of School Business Officials produced a video in recognition of Chapman attorney Lynda Given's work on behalf of Illinois school districts. On March 9, 2016, the U.S. Securities and Exchange Commission issued a cease and desist order against Westlands Water District, a public agency of the State of California, the District General Manager and General Counsel, and the former District Assistant General Manager. On February 10, 2016, the Government Finance Officers Association alerted its members that the Enforcement Division of the Securities and Exchange Commission has begun contacting issuers in connection with its Municipalities Continuing Disclosure Cooperation initiative. On February 2, 2016, in the third round of settlements with underwriters under its Municipalities Continuing Disclosure Cooperation initiative, the Securities and Exchange Commission issued cease-and-desist orders to 14 underwriting firms. Today, the Illinois State Board of Education approved allocation guidelines and an application process for Qualified School Construction Bonds. Pursuant to such guidelines and process, ISBE expects to allocate $495,602,000 in volume limitation for QSCBs to school districts. On October 26, 2015, the Department of the Treasury released Final Regulations on allocation and accounting, and certain remedial actions, for purposes of the private activity bond restrictions that apply to tax-exempt bonds. On September 30, 2015, in the second round of settlements with underwriters under its Municipalities Continuing Disclosure Cooperation initiative, the Securities and Exchange Commission issued cease-and-desist orders to 22 underwriting firms. On August 13, 2015, the Securities and Exchange Commission issued a cease-and-desist order against Edward D. Jones & Co., L.P., in response to alleged improper trading practices by the St. Louis-based broker-dealer. Tax freeze legislation recently passed by the Illinois Senate would impact every taxing district in the State if it ultimately becomes law. On June 18, 2015, the Securities and Exchange Commission issued cease-and-desist orders to 36 underwriting firms in response to voluntary self-reporting of potential misrepresentations in municipal bond offering documents regarding compliance by issuers with prior disclosure obligations under the SEC’s Municipalities Continuing Disclosure Cooperation initiative. On June 18, 2015, the Securities and Exchange Commission issued cease-and-desist orders to 36 underwriting firms in response to voluntary self-reporting of misrepresentations in municipal bond offering documents regarding compliance with prior disclosure obligations under its Municipalities Continuing Disclosure Cooperation initiative. As indicated in our January 20, 2015 Client Alert, the Obama Administration previously announced in general terms its Fiscal Year 2016 budget plans with respect to the maintenance and improvement of US public infrastructure. On January 16, 2015, the Obama Administration announced in general terms its plans with respect to the maintenance and improvement of public infrastructure, including roads, bridges, ports, water purification plants, and reservoirs, all of which are deemed critical services by the Administration for consumers and businesses alike. Congress recently authorized an additional $400 million of nationwide volume cap for the qualified zone academy bond program. On November 6, 2014, the Securities and Exchange Commission announced that fraud charges had been issued against the city of Allen Park, Michigan, and two former city leaders. On October 24, 2014, the IRS issued Notice 2014-67, Private Business Use of Tax-Exempt Bond Financed Facilities. The Notice expands the management contract safe harbor guidelines of Revenue Procedure 97-13 to permit certain productivity awards and liberalizes the requirements for certain types of 5-year contracts that will not result in private business use. An article based on a recent Chapman Client Alert was posted by the Harvard Law School Forum on Corporate Governance and Financial Regulation. Issuers and obligated persons are reminded of the approaching deadline for self-reporting materially inaccurate representations in offering documents regarding compliance with continuing disclosure undertakings.